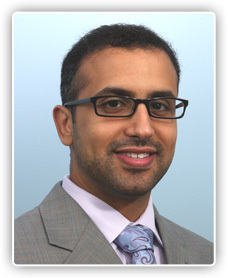 Dr. Ahmed Sufyan at Mid-Michigan, Ear, Nose, and Throat, P.C. Learn about Dr. Sufyan's East Lansing plastic surgery office! Dr. Sufyan attended Indiana University school of Medicine and graduated with both research and academic honors, one of only two physicians’ to receive this recognition. He also completed an Otolaryngology-Head and Neck Surgery residency at Indiana University, and scored the top mark nationally on the specialty training exam. During residency, with his creative artistic background, Dr. Sufyan was drawn to a career in facial plastic and reconstructive surgery. Following surgical residency, Dr. Sufyan completed one of the most sought after fellowship programs in the country for facial plastic and reconstructive surgery with an international leader and expert in facial plastic surgery and the current elected president of the American Academy of Facial Plastic and Reconstructive Surgery Dr. Edwin Williams. While training with Dr. Williams, Dr. Sufyan developed his own private practice performing the full range of cosmetic and reconstructive procedures for his patients. Additionally, he was able to volunteer his time to help foster the facial plastic surgery skills and knowledge of the Otolaryngology residents in New York. Dr. Sufyan has published articles, book chapters, and presented research nationally and internationally relating to otolaryngology, and plastic and reconstructive surgery of the head and neck. He plans to continue to advance the field of facial plastic and reconstructive surgery throughout his career with further publications, and educational efforts. Prishmann J, Sufyan, A.S, Ting, J.Y, Perkins S.W.Dry Eye Symptoms and Chemosis following Blepharoplasty: a 10 year retrospective review in a single-surgeon practice. Arch Facial Plast Surg. 2012;(10):1-8. Sufyan, A.S, Wannamuler,T.J, Halum, S.H.The Interarytenoid Spatial Relationship: Accuracy and Inter-Rater Reliability for Determining Sidedness in Cases of Unilateral Adductor Paresis. J Voice. 2013 Jan;27(1):90-4. Sufyan. A.S, Hirsolamlos E.F., Kokoska, M.S; Shipchandler T.Z. The Effects of Alar Batten Grafts on Nasal Airway Obstruction and Nasal Steroid Use in Patients with Nasal Valve Collapse and Nasal Allergic Symptoms: A Prospective Study JAMA Facial Plast Surg. 2013 Feb 28:1-5. Shah HA, Shipchandler TZ, Sufyan AS, Nunery WR, Lee HB.Use of fracture size and soft tissue herniation on computed tomography to predict diplopia in isolated orbital floor fractures Am J Otolaryngol. 2013 Mar 22. pii: S0196-0709(13)00057-4. Sufyan, A.S; Williams E. Key Principles in Running a Successful Business in Facial Plastics. Facial Plast Surg 2014;30:171–173.